The possibility of a flea or mite infestation in one’s home is a very troubling concern…pet-owners’ fears about this have been the source of many distressed calls for assistance that I have received over the years. The good news for bird keepers is that external parasites are not all that common among our feathered friends, and most are very specific in their host preferences. The few that do crop up from time to time are of concern, but all can be eliminated fairly easily, especially if detected early. 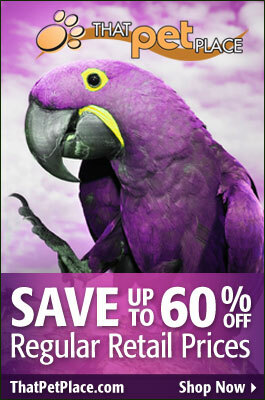 A careful daily check of your bird is the key to early detection of a parasite problem. This is particularly important if you keep several birds, have recently added a new individual to your collection, or have brought your bird to a pet store for wing or nail clipping. Bear in mind that not all feather and skin abnormalities are caused by parasites – feather chewing, poor nutrition and viral, bacterial or fungal disease are all possibilities (and, indeed, more likely than parasitic infestation). If you do discover mites or lice, a good first line treatment is Scalex Mite and Lice Spray . While this pyrethrin-based medication is often successful in eliminating the invaders, a visit to your veterinarian for a positive ID of the species involved is important (also, secondary problems, such as bacterial infections, are often associated with parasites). As most parasite eggs are unaffected by medications, you’ll need to space out the application of the spray as directed in the instructions in order to eliminate the pests as they hatch. Small Arachnids (spider and tick relatives) known as red mites, Dermanyssus gallinae and related species, are the most troublesome pests in terms of transmission to other pets and people. These mites are not choosy as to their host and, unlike most avian parasites, leave the bird at night to deposit eggs in perches, nests, furniture and rugs. They can be observed crawling about the afflicted bird at night, or attached to a white sheet that has been draped over the cage. You veterinarian will likely use Ivermectin as a treatment; red mites feed upon blood, so tests for anemia and bacterial infection are also recommended. You should consult with your doctor and a professional exterminator concerning how best to eliminate lice that might possibly have taken refuge in your home or if you observe any upon your skin. 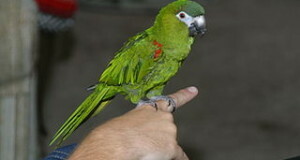 The mite most commonly found on pet birds is scaly face mite, Knemidokptes pilae. It is almost entirely limited to budgerigars, only rarely afflicting other parrots or, less commonly, finches, and does not establish itself on other pets or people. Scaly face mites are usually found around the cere (the area just above the beak), vent and legs. They burrow into theses areas, leaving tiny holes in the skin and a powdery plaque in their wake. 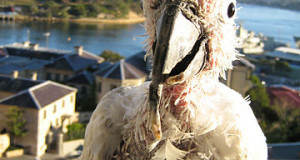 As you can imagine, the unfortunate bird becomes extremely uncomfortable and scratches at the affected areas. In severe infestations, the bill itself may be damaged. The mites themselves are not visible to the naked eye. In finches, a related mite tends to focus on the feet – birds so afflicted are said to have “tasselfoot”. Mineral oil spread about the skin to suffocate the mites is often effective, but treatment with Ivermectin is preferable. Air sac mites remain within the respiratory tract and are most frequently seen in canaries and other finches. Birds parasitized by these mites usually breathe heavily, with their beaks wide open. Related species, termed tracheal mites, cause “gape mouth”, a condition seen in turacos and other species commonly kept in zoo collections. Ivermectin is the drug of choice, but it must be administered carefully – a die-off of large numbers of mites at once can cause the host bird to suffocate. Lice are parasitic insects. 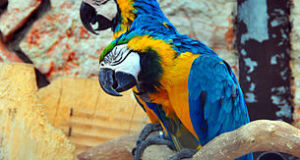 Less commonly seen in pet birds than mites, various types feed upon blood, feathers or skin. Some types concentrate at the bases of the feathers, while others attach to the feathers’ lower surfaces or the skin itself. Nearly all lice are very specific as concerns host selection, feeding upon only one particular bird species. Bird lice will not attack people or other pets, and are sensitive to Scalex (pyrethrin spray) and Ivermectin. Because lice damage the skin, a veterinarian should be consulted to rule out the possibility of a secondary bacterial infection. Always wash well with warm water and anti-bacterial soap after handling a bird that is parasitized by mites or lice, and launder your clothes in hot water. Consult your doctor and a professional exterminator if you observe these invertebrates on your person or in your home. A number of feather and skin conditions mimic the symptoms of a mite or lice infestation. You can learn how to recognize many of these at http://www.birdsnways.com/wisdom/ww48eiv.htm. Click here to read the 2nd half of this article.